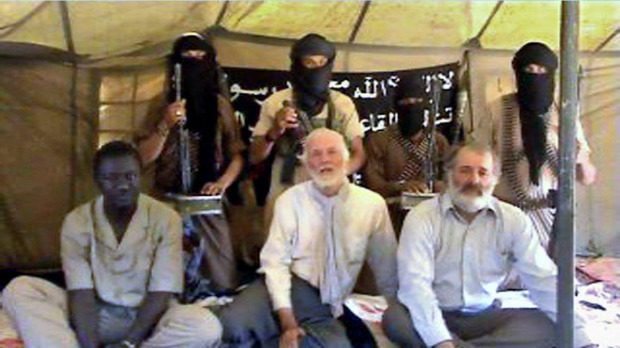 In late 2008 Canadian UN special envoy Robert Fowler was kidnapped near Niamey with his assistant Louis Guay and their local Malian driver, Soumana Moukaila (left). All were held captive in northern Mali by Moktar Belmoktar’s (MBM) AQIM katiba or group. Following the lull after the mass kidnappings of 2003 in Algeria, it was a pattern that came to be repeated frequently from 2008. Excluding what’s currently going on in Nigeria, in north Mali today there ought to be nine non-African captives of six nationalities (mostly French) as well as five Africans taken from five separate abductions across the Sahara. Full list of dates, locations and outcomes at the bottom of this page. 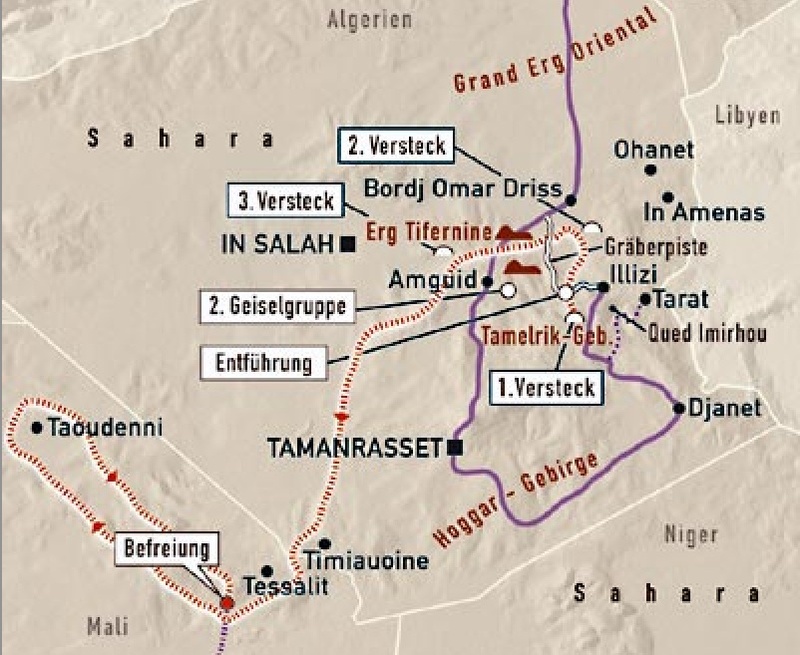 But just a year before Fowler was grabbed, Oxford-based anthropologist, Judith Scheele was travelling up and down the Tanezrouft, principally between Gao and the Touat region around Adrar in western Algeria, researching the origins and nature of the ‘connectivity’ that has long linked the two regions. 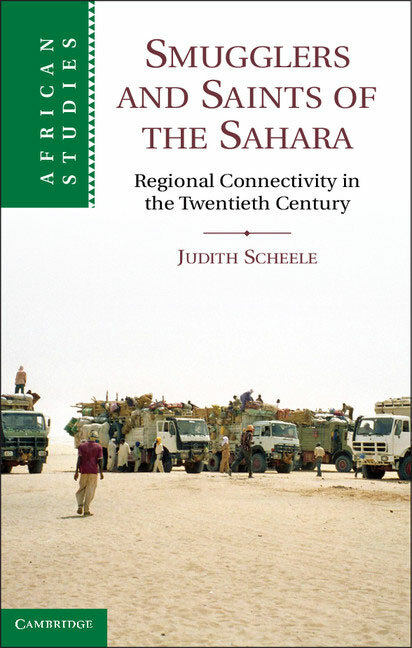 Her book, Smugglers and Saints of the Sahara: Regional Connectivity in the Twentieth Century is an anthropological treatise on south Algeria and north Mali. Fowler’s book is A Season in Hell, my 130 days in the Sahara with Al Qaeda – a self-explanatory title. 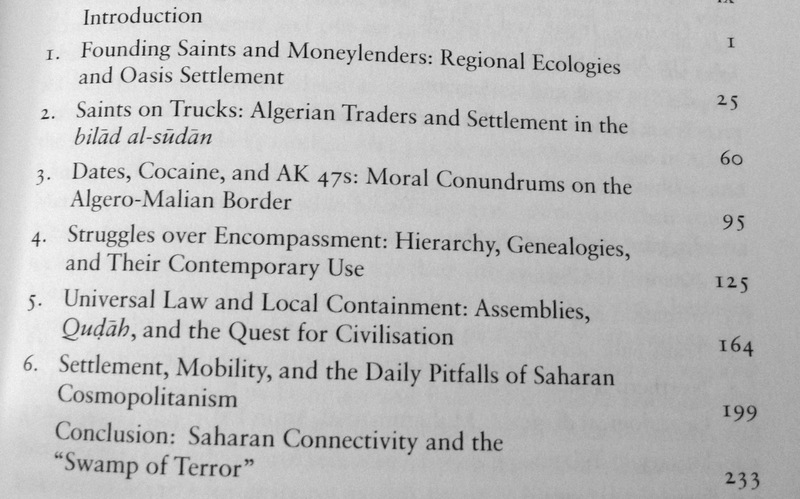 Smugglers and Saints of the Sahara describes life on and around the contemporary border between Algeria and Mali, exploring current developments in a broad historical and socioeconomic context. Basing her findings on long-term fieldwork with trading families, truckers, smugglers and scholars, Judith Scheele investigates the history of contemporary patterns of mobility from the late nineteenth century to the present. Through a careful analysis of family ties and local economic records, this book shows how long-standing mobility and interdependence have shaped not only local economies, but also notions of social hierarchy, morality and political legitimacy, creating patterns that endure today and that need to be taken into account in any empirically-grounded study of the region. Sounds like an interesting place. I visited the outpost twice in 2006, a short while after I was told the Malian douaniers (Customs) like the gendarmes above, had been kicked out, leaving the place to its own devices. One of my visits was while passing through with a car to offload in Mali (it was actually getting reprofiled to return to Algeria as my guide’s car). I took the chance to get in with the chummy crew who were my guide’s contacts in Al Khalil; what the exact connection was I did not ask. They occupied l’Ambassade (possibly an in-joke with those that frequented it), a compound or garaj like many others in town, composed of a head-high mud-brick wall where ancient MAN or Mercedes trucks were being overloaded or refuelled. Beaten up oil drums, axles and other junk lay all around and a couple of shacks or shaded reed zeribas perched against the perimeter wall. There was no running water or electricity other than truck batteries. The toilet was like a deleted scene from a slasher movie. Al Khalil was by that time a stateless entity in No Man’s Land, some 100km north of the first Malian town at Tessalit where in 2006 at least the Malian army had a presence and stamped us in. The crew at the l’Ambassade weren’t like the braggarts that Judith Scheele describes, and seemed a rather amiable bunch of possibly Berabich Arabs, a consequence one likes to think, of their avowed trade in ‘soft’ commodities between Algeria or Zouerat and their distant home town of Timbuktu. I sold some sat phones or GPSs and promised to return with solar panels and other requests – something I occasionally do to help establish a connection with guides or other local contacts. In this case my motivation was to help ease my imminent traverse of northern Mali should I get in trouble. In a way I was participating in the mutually beneficial connectivity about which Judith Scheele writes, while not going quite as far as marrying one of the ‘Ambassadors” daughters to seal a trading communion. Sure enough, two months later I was in trouble before I even got out of eastern Mauritania and was able to call in a truck via the Ambassade to recover me back to In Khalil. 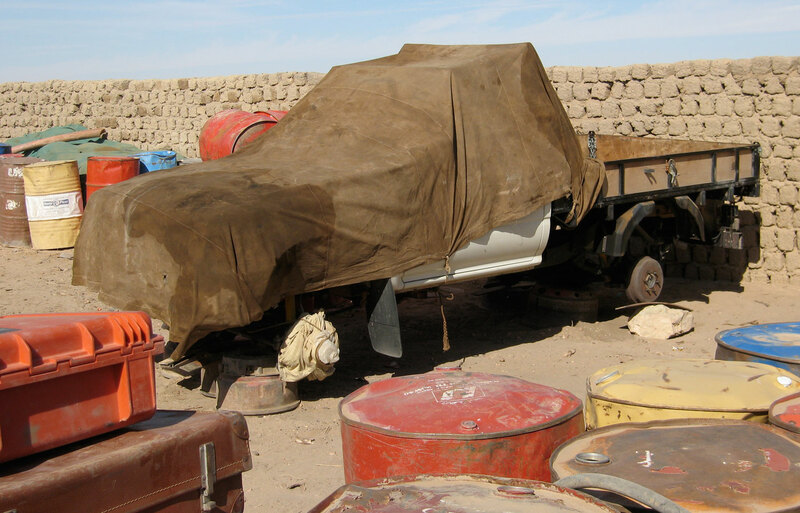 Last I heard my Hilux still rests under an oily tarp in the corner of the Ambassade (right). Steele describes the drivers and dealers in Al Khalil as a recognisable mix of bravado and exaggeration, boasting about their contrabanders’ adventures running goods along the hidden pistes while dodging patrols and ambushes from competitors. These traders claimed a distinct moral separation between ‘soft’ goods like sugar, fuel and staples, and harder items, the hardest of all being cocaine. It’s fair to speculate that as much as AQIM’s occupation of northern Mali, it is the similarly recent advent of a new cocaine route to Europe, from Colombia via Guinea Bissau or Mauritania right across to the Red Sea that has upset the trading traditions she documents. No longer can a plucky young guy knock out a couple of trans-border runs for a patron to earn himself the HJZ79 he was provided. As you’d expect with hard drugs, now much more organised mafias – in some places not far removed from state institutions – are running the show and paying flat rates for young guns in search of nothing more than adventure. “Although al-Khalil might for all intents and purposes look like a town, it lacks in morality and is therefore locally understood to be part of the badiya… As such it remains beyond the bounds of civilisation and is described as potentially dangerous to “proper” family life and sociabilities. This is perhaps why, in their interminable boasts, Khalilis endlessly endorse “traditional” morality, as though they were trying to integrate al-Khalil within known frameworks of excellence and moral propriety: al-Khalil is decried as a place where men can be men, although everybody knows that the moral autonomy and social responsibility this implies are often illusory. The series of traders’ compounds or garajs shown in the sat image on the left isn’t a place where a European stranger idly noses around for too long, and you get the feeling that even with her protectors, the author didn’t spend much time there, as she did in the regular settlements in Mali and Algeria. That she achieved what she did over months in this area is a testament in her ability in getting to know the right people and gaining their trust. A short while after both I and Judith Scheele visited, Al Khalil became quite a dangerous place indeed and now, a few months following the French led Operation Serval, you imagine things may have turned full circle. It has to be said that once beyond the lively and engaging introduction, the book gets down to business and at times becomes a bit of an effort to read. The chapters are listed on the right give you an idea of what to expect. Credit is due to the author’s tenacity, bravery and fluency in local languages, although part her success may have been in being perceived by the men as just a ‘harmless woman’. It gave her the best of both worlds: sisterly access to local women no male counterpart could have achieved, while at other times able to move around as a protected ‘honorary male’, as lone women travellers often find, particularly in Muslim lands. 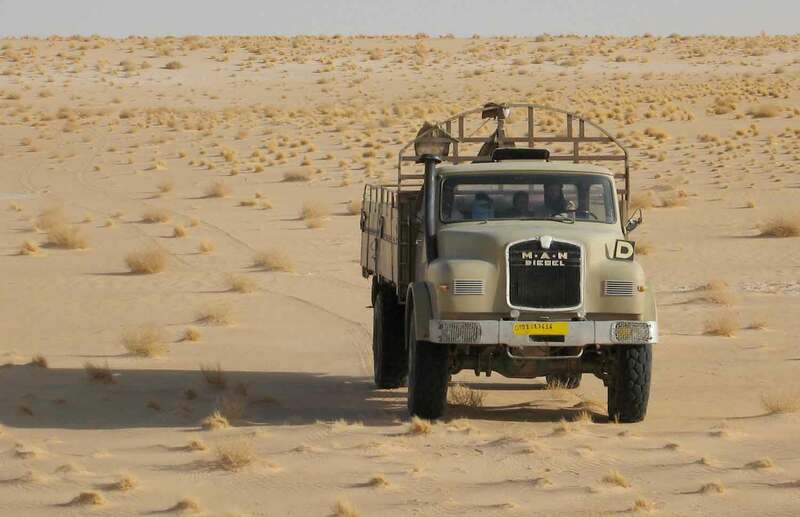 At one point her convoy is held up in southern Algeria en route to Mali until the driver explains to the brigands that he’s travelling en famille – as in ‘steady on chum, there are women present’. Travelling sans famille, on the way to meet us in 2006, the Ambassade’s truck (left) had a similar encounter and was less fortunate. It’s a touching example of the sort of code of honour we like to imagine exists among Saharan smugglers. They are after all merely engaged in tax-exempt trading that was disrupted or penalised when the French began their century-long project of colonising Algeria in the early 19th century. Since then, following the post-colonial era of the early 1960s, new governments settled age-old racial scores. I have long assumed that the neglect of the desert Tuareg in Mali’s Ifoghas and the Aïr in Niger was a form of payback for the bad old slave trading days. It forced places like the Ifoghas to rely heavily on subsidised goods coming down from Algeria and until very recently the Malian government still professed that the ‘Tuareg problem’ in the north was a greater threat than AQIM and associated terrorist groups. In Saints we learn much about the demography, racial make up and historical links across the region. The Tilemsi Arabs who originated from Mauritania and include the shady mayor or Tarkint (more of him below). Or the Kunta Arabs, a sect that led by a ‘saint’, settled from an oasis in the Touat Algeria a century or two ago. Indeed it was Arab traders from there who founded Kidal, the current ‘capital’ of the Kel Ifoghas Tuareg. These early traders and other notables have metamorphosed into ‘saints’ possessed of baraka (blessing) or even got upgraded to ‘sharif’, noble descendants of the Prophet. It’s a form of religious aristocracy mentioned in an earlier post about Judith Scheele’s visit to Arawan around the same time. Staying with PCVs in Mauritania in the late ’80s, I recall coming across a term ‘hassan’, with the same meaning or ‘legitimacy’ as sharif. At one point the author profiles the ‘Alkacem’ clan of Tamanrasset, a successful trading family of business-minded Chaambi Arabs who moved there from northern Algeria around Ouargla and Ghardaia. From the earliest days of the French colonisation the Chaambi worked with the administration rather than fighting it, like the Ahaggar Tuareg right up to their decisive defeat near Tam in 1911. We learn that similarly, the modern Alkacem have shrewdly developed ties with the government to their great advantage. It chimes with a meeting I had with what I took to be a patriarch of that family a couple of years ago while organising a tour. I could tell this guy was a busy homme d’affairs who these days, more than ever, surely couldn’t be making a living from his tour agency. With his shiny fleet of Hiluxes, I assumed he must have more profitable interests like property or transport, his agency being a hang over from the good years and which had been palm-off to his somewhat feckless son. The patriarch told me his family had moved down a century ago from their home oasis of Metlili Chaamba just south of Ghardaia. These passing connections made Saints a little more digestible for me but while there must be a certain received form to academic writing that is indubitably objective and correct, the jargon (satirised rather amusingly here) doesn’t exactly leap from the page with arms outstretched. It is after all a meticulous report on the author’s fieldwork to be pored over by her peers, not an adventure travelogue. Nevertheless, as a tourist in the region you frequently feel that you’re skimming over what’s really going on around you, especially when pre-occupied with keeping your own all-terrain show on the piste. 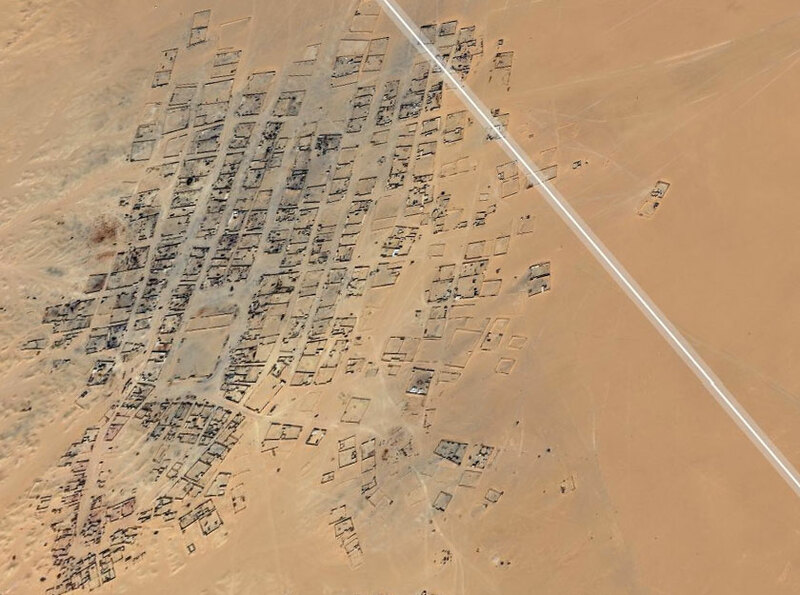 Saints helps fill in the blanks about a Sahara where people actually live, a place beyond the string of waypoints linking fuel stations, junctions and wells. We learn a lot about the complex interconnectivity of race, skin colour and Arab assumptions of moral, intellectual and religious superiority, despite the envied lure of the licentious suwadeen. About appearances, status, how to get ahead in business as an Arabic woman of standing while scrupulously maintaining a respectful pubic image (in short: travel for business but lock up your daughters). Along the way Judith Scheele has amassed a bibliography on associated topics that could keep you reading for years. There are many other anthropologists out there working to unravel the secrets of the Sahara. She concludes by politely scoffing at what you suspect she views is a rather male-oriented view of today’s Sahara as a lawless “swamp of terror” to quote an American general. A wilderness of wily bandits and fanatical mudjihadeen that must be brought under control before it all gets out of hand. It’s an image that’s carried by the mainstream media too and the author admits that much of her research was completed before current AQIM activities hit their stride, let along the recent fall of Gaddafi’s Libya which has further stoked the fire. Al Khalil may get pushed off the map she concludes, but it will simply pop up somewhere else because in the Sahara, like elsewhere else, life goes on. This entry was posted in Desert Babbles (blog) and tagged 177 Tage Angst, Adagh (Mali), Adrar des Ifoghas, Al Khalil, Algeria, AQIM in Mali, Judith Scheele, Kidal, Mali Sahara, MBM, Moktar Belmoktar, Petra bracht, Rainer Bracht, Robert Fowler, Sahara kidnapping, sahara smuggling, Smugglers and Saints of the Sahara, Touat, Virtual Academic: a random sentence generator on April 27, 2013 by Chris S.